NIMS BSc(Nursing), BPT, MHM Courses Admissions 2017 notification, NIMS BSc(Nursing) Course admissions application form, NIMS BPT Course admissions application form 2017, NIMS MHM Course application form 2017. 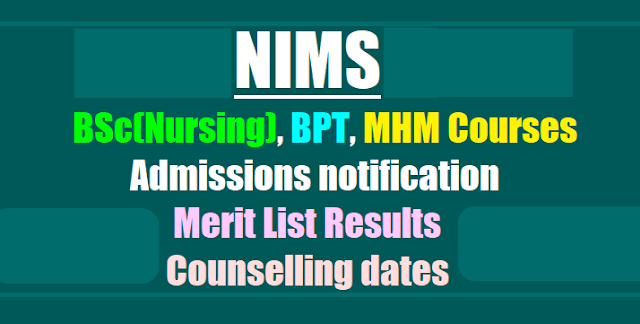 Nizam's Institute of Medical Sciences, Punjagutta, Hyderabad, Telangana State has given the NIMS BSc(Nursing), BPT, MHM Courses Admissions 2017 notification and applications are invited from eligible candidates of Telangana and Andhra Pradesh States for admission into B.Sc. (Nursing) Course, Bachelor of Physiotherapy (BPT) Course and Master in Hospital Management (MHM) Course for the year 2017. Candidates should passed in Intermediate Bi.P.C. or equivalent course from the academic year 2017-18 and there will be no entrance (NIMSET)examination for the above mentioned courses. The selection of the candidates for the admission into Bachelor of Science (Nursing) and Bachelor of Physiotherapy (BPT) courses is based on merit arrived out of total marks obtained in the qualifying examination i.e., Intermediate Bi.P.C. or equivalent course from the academic year 2017-18 and there will be no entrance (NIMSET)examination for the above mentioned courses. However, the entrance examination will be conducted for Master in Hospital Management (MHM) course. The details are mentioned in the prospectus. The candidates are requested to visit website: www.nims.edu.in for application form, prospectus and also for any updates. The filled in application forms shall be submitted along with Demand Draft in favour of Director, NIMS or NIMS cash receipt and supporting documents as detailed in prospectus (Annexure I) in person or by post (preferably by India Post services) so as to reach the Associate Dean, Academic-2, 2"d floor, Old OPD Block, NIMS, Punjagutta, Hyderabad-500 082, Telangana before 5.00 PM of 29-07-2017.